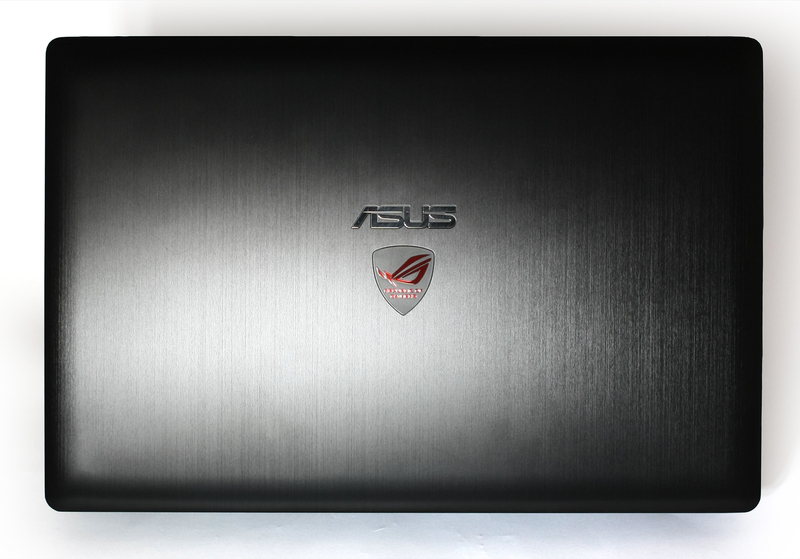 ASUS ROG G501 is one of the most eagerly awaited gaming laptops and also a great example of how powerful hardware doesn’t necessarily have to come in a bulky body. That’s something gamers really appreciate, since they’ve traditionally been forced to bring along heavy machines if they want mobile hardware capable of running the latest games. NVIDIA and its 900M series is already here to take a load off their backs, and ASUS is among the companies which have decided to take advantage of that. Along with the focus on thin-and-light notebooks, the NVIDIA GPUs have received some performance tweaks, and there is also a battery boost, which we’re going to test. Naturally, we won’t be foregoing our usual design and construction as well as display and temperatures examinations. It will be interesting to see how G501 handles high loads, keeping in mind that it’s 21 mm thin. ASUS claims that, thanks to the Hyper Cool technology, this doesn’t present a problem. 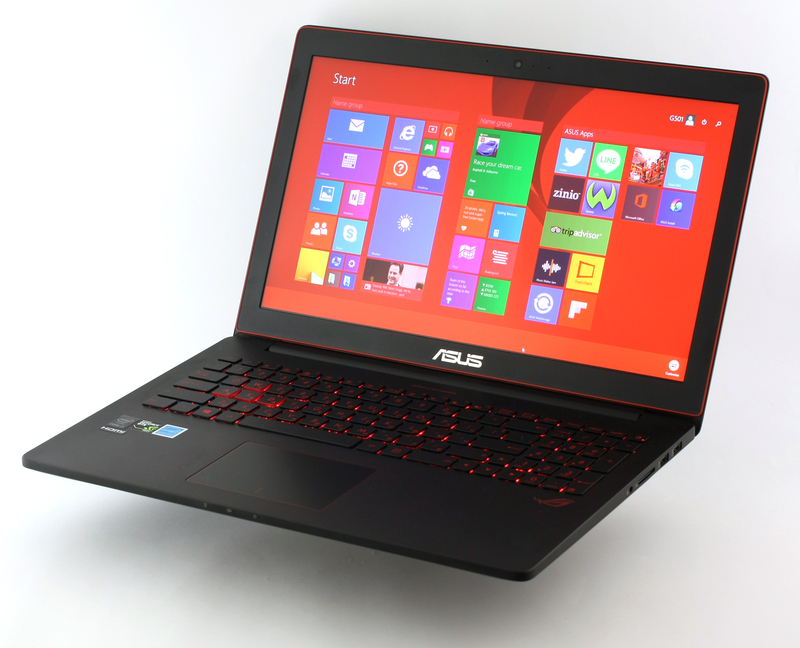 G501 definitely looks cool and if everything is as ASUS says, the only little drawback will be the price. As always, ASUS doesn’t disappoint on the included accessories front. In addition to the laptop, you’re getting a charger (of course), screen wiper, cable tie, EthernetLAN to USB and mini DisplayPort to VGA dongles. Design is the key feature of G501 and if the notebook ends up selling well, you can be certain that the beautiful body is the main reason. 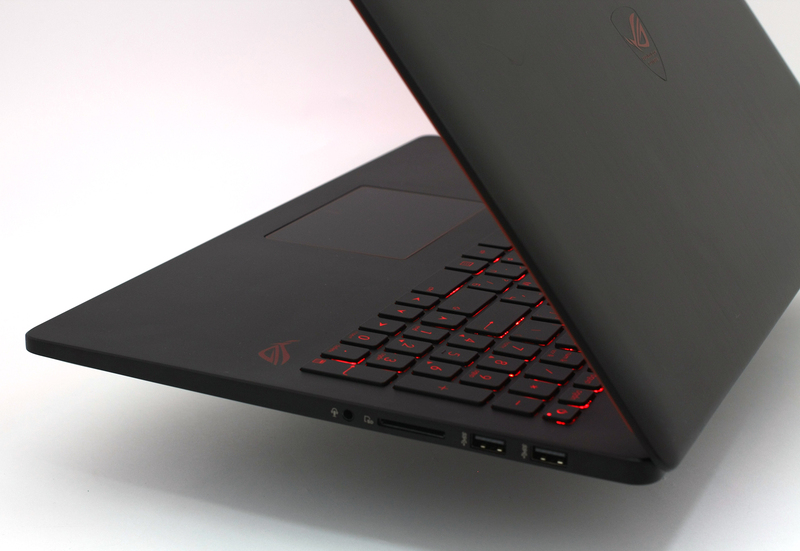 The latest ROG machine is just 20.6 mm thin and weighs 2.06 kg, which is a great achievement, but at this point we’ll save the rest of the size-related superlatives for later. The machine will have earned them should it perform well in our temperature tests. G501 has a beautiful aluminum unibody chassis which gives the impression of a high-end model, which, of course, is what ASUS wants G501 to be. This isn’t the most important reason for using the metal as a main material in G501’s body, though – it has great heat dissipation capabilities which will be crucial given the thin body. Usually, the aluminum construction provides high level of sturdiness and G501 isn’t an exception, except for the slight yield of the keyboard when applying a bit more force. We doubt you’re going to notice that in everyday use, but, suffice it to say, the lack of this kind of instability would be a good indicator of quality engineering and design. The keyboard is an island-style one with decent space between the keys, and when you add the 1.6 mm of key travel you get pretty good responsiveness which reduces typing mistakes. The aggressive red glow will help you in the sleepless nights and makes G501 look even better. If you use the machine for business during the day, you’ll find the NumPad to be quite useful. We liked the fact that the Power button is also part of that, so the overall interior is kept simplified. The trackpad is large and doesn’t have dedicated buttons. Instead, they are placed under the trackpad panel. If you click in the lower right corner, you’ll get a right-click, and if you click anywhere else, your action will be recognized as a left-click. However, similar to the MacBooks, you have the option of tapping a single finger for a left-click and two fingers for a right-click, as well as two-finger “natural scrolling” (content scrolls in the opposite direction of your fingers movement) with two. 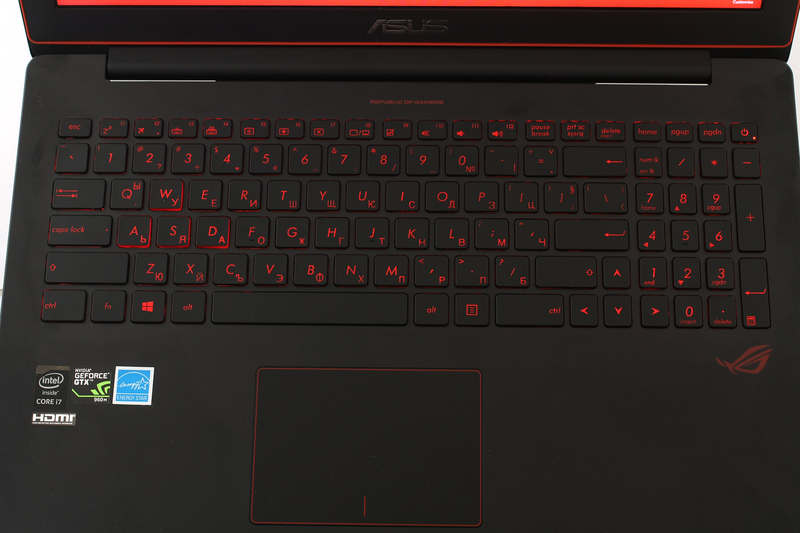 You won’t be distracted by many elements on the main panel, as the only visual details, apart from the keyboard and the trackpad, are the ROG logo and a tiny “Republic of Gamers” inscription. The display panel also looks pretty simple, with just the ASUS logo at the bottom and a rubber band across the whole frame. Although the notebook is pretty thin, it has a decent amount of ports for your peripherals. On the left there are the DC-in port for the charger, mini Display port, HDMI 1.4 and USB 3.0. On the right we have a combo audio jack for speakers/microphone, SD/MMC card reader and another two USB 3.0 ports. The back is clear, while the front sports just some LED indicators. The fact that there’s an 80mm M.2 PCIe slot under the hood is a nice surprise. 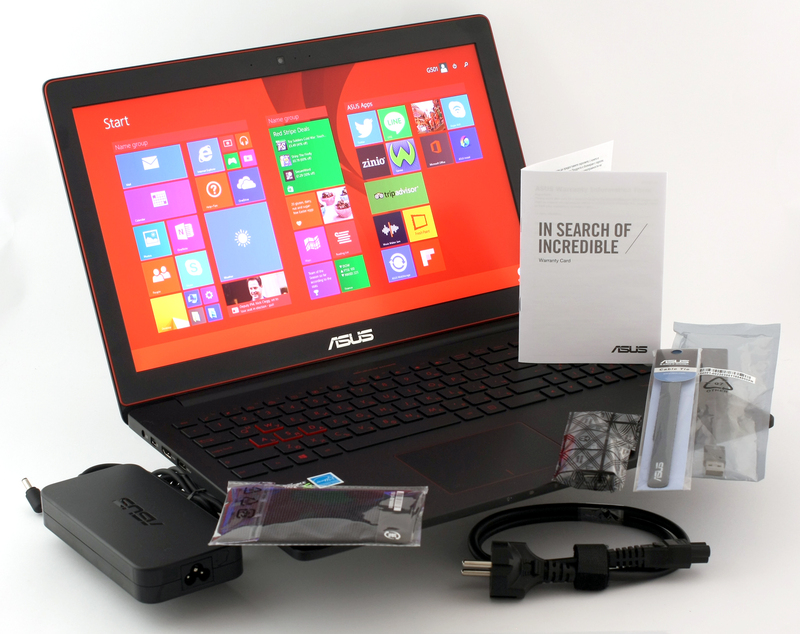 We made a special “Inside” article to show you how you can service the notebook – removing the bottom panel gets you to the 2.5-inch SATA III slot, battery, Wi-Fi card, cooling system and the aforementioned M.2 slot. If you want to know more about the G501 internals, take a look at our “Inside” video below. ASUS G501 has an IPS panel made by Samsung. The model is 156HL01-102 and the resolution is Full HD (1920 x 1080 pixels). It has a 15.6-inch (39.62 cm) diagonal, with 16:9 ratio and pixel density of 141 PPI (0.18 x 0.18 mm dot pitch). All of that means that it can be considered “Retina” if you look at it from a distance greater than 61 cm (24”). Watching the screen at an angle of 45° isn’t a problem due to the IPS technology – picture quality isn’t affected. The measured average maximum brightness before calibration is 322 cd/m2, with a maximum deviation of 12% (acceptable result). The color temperature on a white screen is 8005K – colder than the optimal one – 6500K (D65). 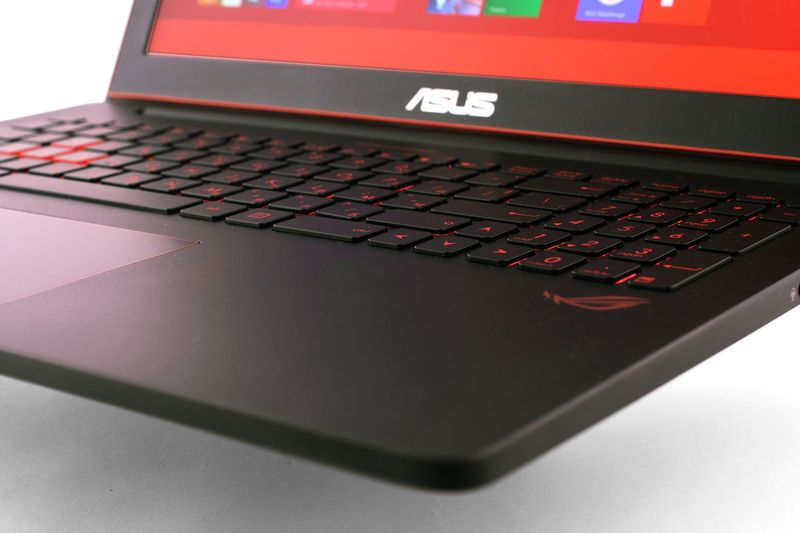 ASUS G501’s display covers 94 percent of the sRGB color gamut and 74% of Adobe RGB. There is just a little part of the red spectrum which remains uncovered. The measured gamma curve has little deviation – low brightness level areas of images will look slightly darker, while high brightness level ones – a little lighter than optimal. We profiled the screen at 200 cd/m2 brightness (59%) and its natural color temperature, but prior to that, we measured the color reproduction accuracy at factory settings. The average DeltaE(76) deviation is 3.45. The screen is accurate enough for gaming and other applications which don’t place high importance on exact colors. We rate it as adequate. The contrast is high – 982:1. This is a new test for us, and you can expect more detailed analyses in the reviews from now on. ASUS G501 has relatively long response time. We measured Fall Time + Rise Time, White/Black, 10%-90% = 30 ms. You can see how the pixels change their state in the graphic below. ASUS G501’s backlight has PWM. It is only missing when the brightness slider is at its maximum. The frequency is low – 200 Hz, which could lead to eye fatigue in continuous use. The fact that lowering the brightness level doesn’t affect the light intensity is an additional disadvantage. 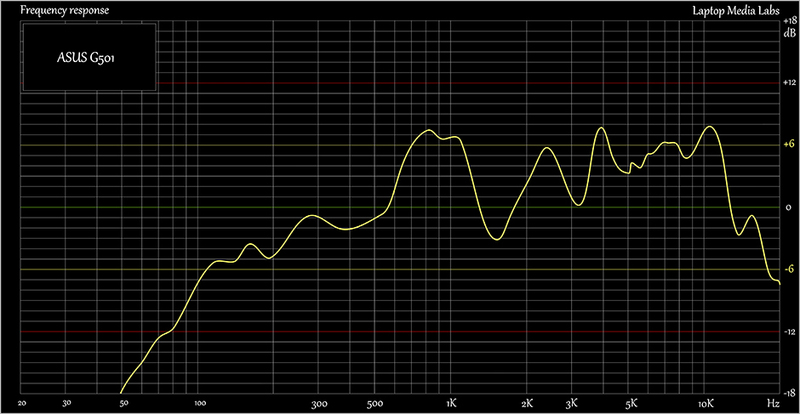 Instead, when the slider is at its minimum position, the screen is lit only for 0.3 ms, followed by 4.7 ms dark phase. We hoped that ASUS would change the Full HD panel for its G501 series, but unfortunately, it’s the same as in G550, G551 and even N551. The problem is that it backlight uses PWM for controlling the brightness, which can cause eye fatigue for some users in prolonged use. Another drawback for gamers is the long pixel response time. On the bright side, G501’s panel has good viewing angles, accurate colors and high brightness and contrast. The low frequency limit (the bass) is one of the best (lowest) we’ve measured in a laptop, ever. Low frequency reproduction requires a lot of volume, and that’s why we don’t expect deep bass (and overall sound quality) from small-sized speakers and devices. In this case, though, we’re testing a product of a company (ASUS/SonicMaster) which is a leader in sound for gaming, and that’s clearly evident here. Very few of the devices we test have a frequency response which fits in the +/- 6dB range for such a wide spectrum of frequencies. The test signal ( an uncompressed 16-bit sound file) was played by VLC Player through the internal speakers. These technical specifications refer only to the particular device being tested in this review. Laptops from the same series could have different characteristics and features. Our G501 configuration has a 60 Wh (4-cell) battery, which has to supply the powerful internals such as the Core i7-4720HQ processor and the GeForce GTX 960M GPU. For most of the tests, 960M will be in stand-by mode because its power won’t be needed, but given that this is a gaming machine, we’ll conduct a detailed high load test. All tests we run at connected Wi-Fi, 120 cd/m2 brightness and Power Saver mode. As usual, we start with the Web browsing test which uses a custom script to automatically load different popular pages. 257 minutes (4 hours and 17 minutes) is a very good result, beating V15 Nitro by 24 minutes. For our Video playback test we use a 720p HD movie. 217 minutes (3 hours and 37 minutes) is another good result for a gaming laptop. Acer Aspire V15 managed to play the movie for 198 minutes and Lenovo Y50 – 181 minutes. The result is 82 minutes (1 hour and 22 minutes). Not bad given the GPU consumption. Although Intel Core i7-4720HQ made its debut in Q1 of 2015, this high-end processor is part of the Haswell family, since the Broadwell generation represents only energy-efficient “U” series chips. The Core i7-4720HQ is a direct successor of the i7-4710HQ which is commonly used in gaming laptops as a raw performance boost due to its higher clock speeds and high power consumption. As usual, the Core i7-4720HQ uses the so-called HyperThreading technology, allowing the CPU to emulate one virtual core for each physical one, thus running 8 threads at the same time with only 4 physical cores. The CPU has a base frequency of 2.6GHz and Turbo Boost up to 3.4GHz for 4 active cores, 3.5GHz for two active cores and 3.6GHz for one active core. This makes the Core i7-4720HQ faster than the Core i7-4710HQ by only 100MHz. The CPU is manufactured through a 22nm process (since it’s part of the Haswell generation). The cache levels are high: 256KB at level 1, 1024KB at level 2, 6144KB at level 3. The maximum operating temperature is 100°C, and as for the maximum TDP – 47W, and that includes the memory controller, VRMs, and integrated graphics. Speaking of which, the Core i7-4720HQ accommodates the Intel HD Graphics 4600 with 20 EU (Execution Units) clocked at 400MHz (up to 1200MHz). The maximum supported memory of the chip is 32GB DDR3L 1333/1600 with two memory channels. Other notable features are HyperThreading, AVX, AVX2, Quick Sync, Virtualization, AES-NI. Fritz is a chess benchmark which tests the computing capabilities of the CPU with various chess moves. The Intel Core i7-4720HQ managed to get 12.451 million moves per second. For comparison, one of the most powerful PCs, Deep(er) Blue, was able to squeeze out 200 million moves per second. In 1997 Deep(er) Blue even beat the famous Garry Kasparov with 3.5 to 2.5. 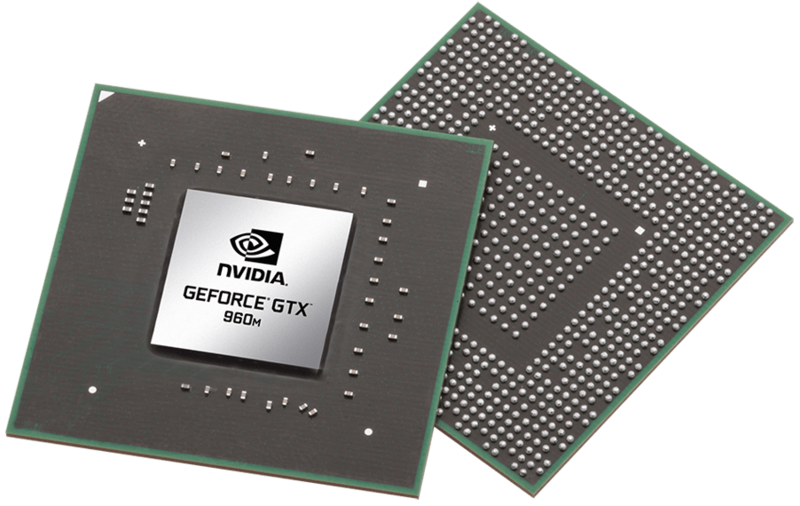 The GeForce GTX 960M (4GB GDDR5) is placed at the high-end of the graphics domain, but it is used mostly in budget gaming laptops. It is part of the Maxwell family of GPUs and features 640 CUDA cores (or simply – shading units), along with 32 ROPs and 53 texture units. It has 4GB of dedicated VRAM, GDDR5 in this case. The bandwidth of the memory is 80.2 GB/s and it has a 128-bit bus. 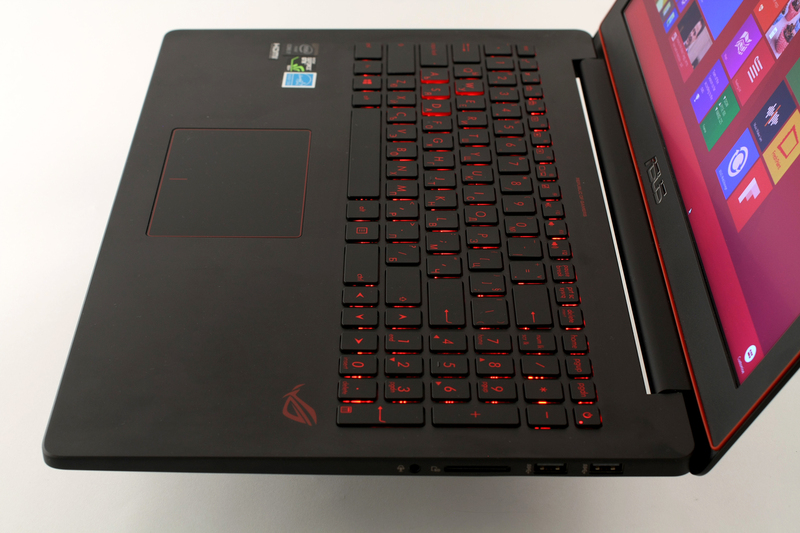 The GTX 960M uses the same GM107 GPU core that we saw in last year’s 860M, but this one is mainly meant to bump the notebook’s battery life and add some extra performance, emphasis on the former. However, the GM107 is clocked a bit higher than last year’s model – 1097MHz base clock and boost up to 1176MHz. It also supports 2048×1536 through VGA and 3840×2160 with DisplayPort and HDMI. We tested G501 with two drivers versions – 350.05 and the newly published 350.12, which are the first drivers to officially support 920M / 930M / 940M / GTX 950M / GTX 960M GPUs. In Metro: Last Light, the new drivers caused 3-15% drop, but in the other games the results are positive. As we already said, it’s more than interesting to see how the G501 cooling system fares against our torture tests. It’s an upgraded Hyper Cool technology with dual independent fans and copper heat sinks for efficient thermal management. At first, we measure the temperatures at light load like Web browsing, Text editing, etc. In this scenario, the CPU hovers around the 41-45C mark and the cooling fans spin at 2000-2300 rpm. We are very satisfied with the G501 cooling system. Despite the super-thin chassis, we didn’t notice any throttling in the first couple of minutes under 100% CPU load. Furthermore, it doesn’t reach over 19% in our 40-minute test and the average CPU frequency was 3.03 GHz (430 MHz above the base clock). We added 100% GPU load for the duration of one more hour. We noted the mean and max temp values of the processor and the graphics card, as well as their respective frequencies. The CPU runs at an average 2450MHz at a mean temperature of 83 C. Maximum temp was 86C. The GPU’s average frequency was 1078/1253MHz at a mean temperature of 75C (max 79C). The hottest point on the main panel was 34C, top-center of the keyboard. Simply put, there are no temperature-related comfort issues. The successful combination of thin body and high performance is next to impossible, but ASUS have done all there is to do to achieve that, and the results are nearly fantastic! As usual, we’ll start with the disadvantages – the thin body has resulted in a little instability in the keyboard panel, although it’s only noticeable if you apply excessive force. The bigger drawback is the PWM of the emitted light, which is an old problem, but ASUS haven’t solved it (at least in the Full HD version). It seems that the 4K version will be nearly perfect if the display handles our tests well. Besides, G501 has impressive looks and size, high-performance components, nice Hyper Cool technology, great sound and an ultra-fast M.2 PCIe slot. It would be remiss of us not to mention that we loved ROG G501 the moment we laid our eyes on it, and we think that this should be the beginning of the ultra-thin, light and powerful gaming era, which we’ve awaited with great eagerness for years. I am trying to install a M.2 SSD and clone it too boot from the SSD but I am having trouble telling me there was an error. Any luck anyone ? can u upgrade its RAM more than 12GB..??? Your temps seem okay if these readings are taken while the game is running. However, if you notice that they are increasing or your CPU and GPU start throttling (reducing their frequencies so they can keep the temperatures below Tj.Max), your notebook and its fans may need cleaning. Simeon Nikolov, I have set brightness level to 100%. 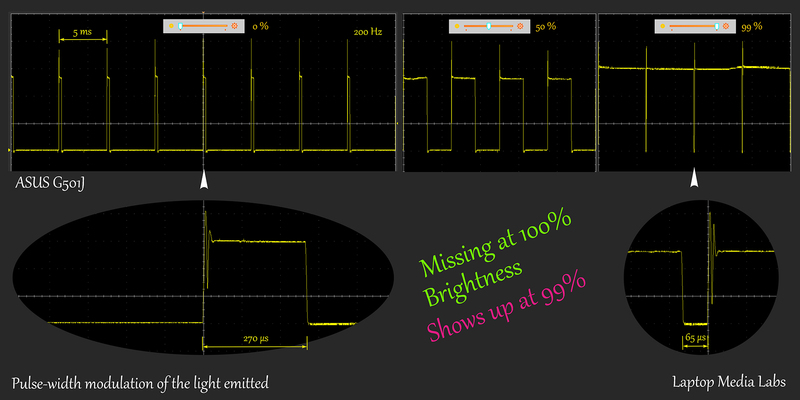 One more question, Every display has no PWM at 100% brightnes or just some? I tried to use SM PM951 PCIe and this ssd cannot be detected. Any idea whether it is incompatible or I’m doing something wrong?